Because ME 490 automatically counts as a technical elective, the Department of Mechanical Engineering requires all Mechanical Engineering students to complete a proposal prior to enrolling in a 490 course, regardless of whether it is with or outside Mechanical Engineering. This proposal is a project and assessment plan that the student develops with their Faculty Supervisor. Students requesting to complete an independent study must follow the guidelines below for the respective workflow. Please complete the form that is applicable to your request. If you are a Mechanical Engineering Student, requesting to complete an independent study with the Mechanical Engineering Department, you must complete the ME 490 Independent Study Proposal. 1. 490 Projects must be technical in nature and require the use of knowledge gained in the ME curriculum. They cannot have significant overlapping outcomes with required ME courses. This is the baseline requirement for all technical electives. 2. Projects must have ‘demonstrable’ learning outcomes that can be directly assessed such as ‘apply the second law of thermo to …’, ‘determine the strength of …’, ‘calculate the uncertainty of …’, etc. Outcomes such as ‘understand how to …’, ‘research the ways to …’, and ‘know how to …’ are not acceptable. 3. Projects must have a clear work description with specific tasks listed. 4. Projects must have specific and tangible deliverables to demonstrate mastery of the outcomes. Weekly meetings, a powerpoint, oral presentation to a grad student, etc. are not acceptable on their own. 4a. A completed prototype from a design activity is not acceptable as a 490 deliverable. A final report demonstrating how the student attained the learning outcomes to complete the prototype is a great way to structure this type of work. 5. Projects must have specific and clear criteria for how the semester grade will be determined in light of the outcomes and using the deliverable(s). There needs to be some possible scenario where a student can get something other than an ‘A’ or ‘F’. 6. The faculty member must directly supervise and assign the grade to the student. It is not acceptable to have all work and assessment performed by a grad student or post-doc. Click here for a copy of the Proposal Guidelines. If you are a student that is Majoring in a different department and you are wishing to complete a 490 with a faculty member in the Department of Mechanical Engineering, please work with your Major Department to get this course added. The Department of Mechanical Engineering has requirements for its students requesting to complete an independent study. 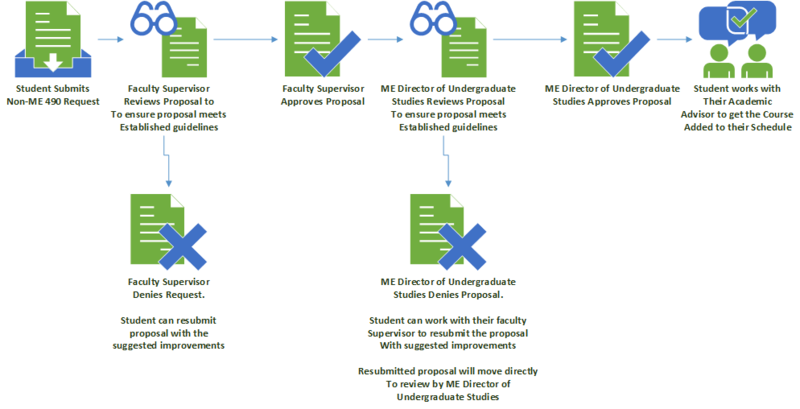 ME students working with faculty outside of the Department of Mechanical Engineering need to work with their proposed Faculty Supervisor to ensure that the Non-ME 490 Approval process is followed. This process is through an online workflow. The Non-ME 490 Technical Elective Proposal is a study plan that must be submitted to the Mechanical Engineering Department prior to a student enrolling in a non-ME 490 course to count towards tech elective credit. 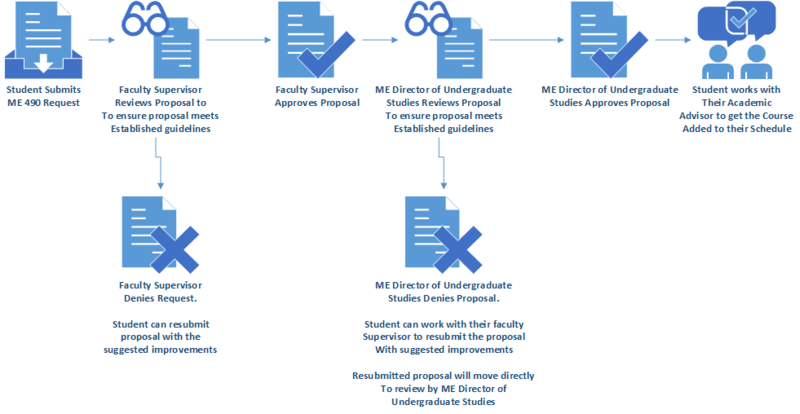 The proposal needs to have sufficient detail so that the Academics Standards Committee can evaluate the relevance of the independent study as a ME Tech Elective and determine if the planned effort justifies the number of proposed credits. If you are a Mechanical Engineering Student requesting to complete an independent study outside the Mechanical Engineering Department, you must complete the Non-ME 490 Tech Elective Proposal. Reminder: If you are looking for technical elective credit for AER E 494, please refer to the ME Make to Innovate Technical Elective Request or contact Matthew Nelson. All Mechanical Engineering students requesting to get technical elective credit for AER E 494 need to submit the ME Make to Innovate Tech Elective Request. Be mindful that this request form has set deadlines that need to be met. If you do not submit the technical elective request and get it approved, you will not receive technical elective credit.